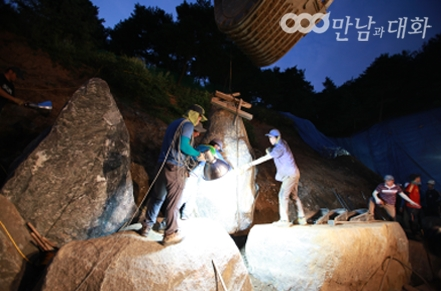 The finishing touch of the Wolmyeongdong rock landscape, the construction on <the Wolmyeongdong Natural Temple Banquet Courtyard>, finally begins! 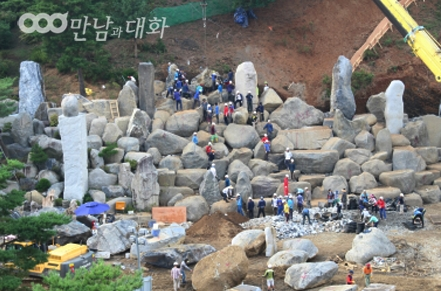 On the rock landscape entitled the Wolmyeongdong Natural Temple Banquet Courtyard, the first rock was finally placed on August 9, 2016. ▲ A panorama of the banquet courtyard. The swimming pool that will be placed under the waterfall in the center can be seen as well. The place where the Banquet Courtyard rock landscape will be located is an extensive space that can be seen as soon as you pass by the pond at the entrance of the Wolmyeongdong Natural Temple. A waterfall will be placed in the center of the Banquet Courtyard, and under the waterfall, a 21-meter long swimming pool will be made. 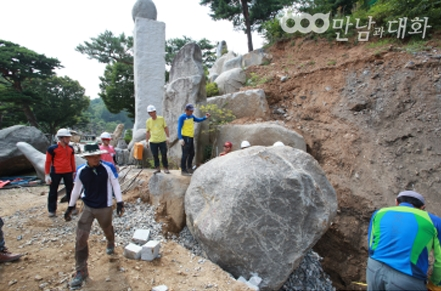 On August 9, under the directions of Jung Beom Seok, the director of the retreat center, the first rock was placed on the rock landscape. On that day, the work of the Banquet Courtyard construction continued until late evening. It reflected how fervently the workers were working. 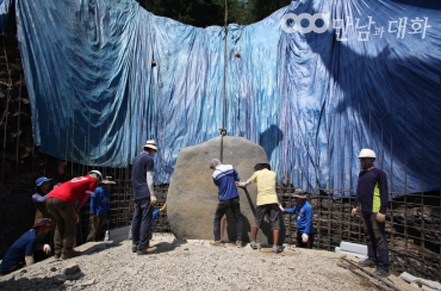 ▲ With Jung Beom Seok, the director of the retreat center, as the head, people place the first rock of the Banquet Courtyard on the rock landscape. ▲ People work on the Banquet Courtyard until late in the night. The Banquet Courtyard construction that began on August 9 continued heedlessly without regards to August’s hot summer weather. 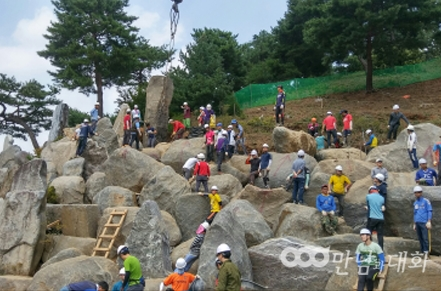 ▲ People place a rock in the center of the waterfall of the Banquet Courtyard on August 11. The workers worked hard under the blazing sun, sweating as if they were being drenched by rain. While working, they felt a cool breeze, so they looked up towards the sky. They saw that huge clouds were covering the sky. Indeed! God already knew better and provided shade with pillars of clouds. There were many days like this, so the temple constructors and foreign and domestic volunteer workers could not help but continuously offer thanksgiving and glory to God. 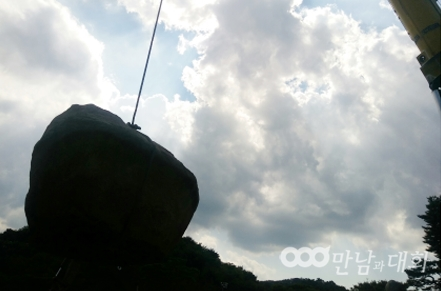 ▲ A crane lifts a rock during the time God covered the sun with pillars of clouds on August 22. 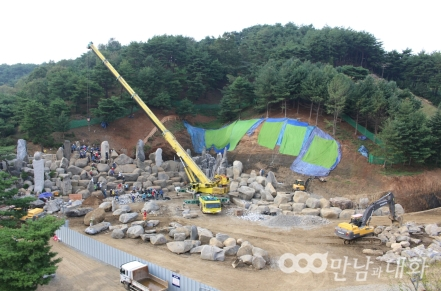 Pastor Jung Myeong Seok gave a special message saying that the Banquet Courtyard rock landscape would be the finishing touch among the Wolmyeongdong rock landscapes. It was a very hot summer compared with the previous years, but the construction proceeded without any accidents under the Holy Trinity’s protection. Furthermore, with fiery interest from the followers of the Christian Gospel Mission Church all throughout the world, centering on the Taiwanese and Japanese members, many followers from the country participated together in the construction. So within one month, with lots of grace,the Banquet Courtyard has nearly been equipped with a certain form. 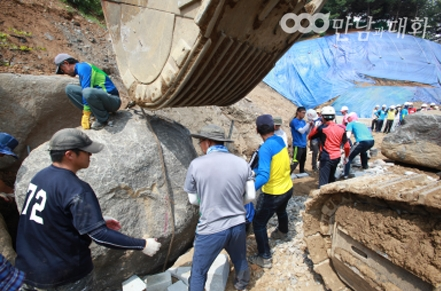 ▲ People work on the construction of the Banquet Courtyard in the Wolmyeongdong Natural Temple on September 1. 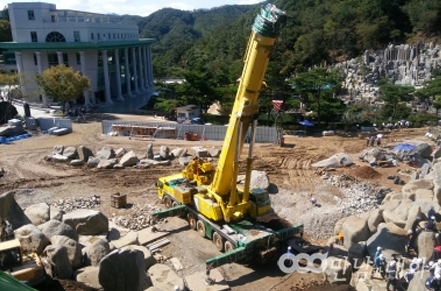 ▲ The image of the Wolmyeongdong Natural Temple Banquet Courtyard construction site on September 8. When standing at the top of the waterfall that is being made in the Banquet Courtyard of the Wolmyeongdong Natural Temple, you can see that it has the greatest view of the Holy Son’s House of Love and the waterfall next to the Wolmyeong Lake. The view is wide. ▲ The view seen from the top of the waterfall of the Banquet Courtyard in the Wolmyeongdong Natural Temple. 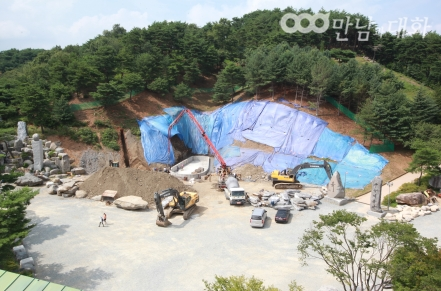 Our hearts are filled with fire and conviction in this Wolmyeongdong Natural Temple Banquet Hall construction. It will be one of the greatest artworks made according to God’s design since it is being made together with prayer and the participation of the followers of the Christian Gospel Mission Church all over the world.